When Iain Small suggested we pay a visit to Number Five Gully Buttress on the Ben, I was intrigued. 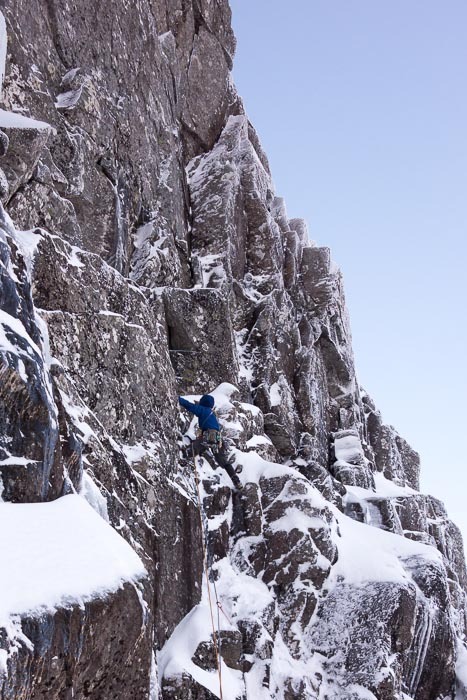 This steep diamond-shaped wall nestled between Number Five Gully and Ledge Route has a south-easterly aspect and rarely holds winter conditions for long, but Iain reasoned with the cold, snowy weather it was worth a look. The buttress has been largely ignored in winter until recently when Malcolm Bass – Simon Yearsley team (ably assisted by Jim Higgins and Helen Rennard) have made ascents of Free Range and Turkish. Both routes are based on summer lines and look pretty meaty Grade VIIs. The other winter route on the wall is Slanting Slit (VI,6), based on the summer VS line of The Slant. It was first climbed by Mal Duff and S.Greenhaugh in 1994, and like many of Mal’s Nevis routes it looks an inspiring climb and well ahead of its time. Ben Nevis was very beautiful on January 31, but conditions were far from optimal with deep powdery snow and no underlying base. We waded up to the buttress from the left over Moonlight Gully Buttress and set off up Fives Wall a – Jimmy Marshall summer route from 1953. Intriguingly, this was the first ever route that Marshall (who celebrated his 90th birthday last week) climbed on Nevis. The first pitch was harder than it looked, and featured a lonely 15m-high unprotected wall that Iain climbed on blobs of centimeter-thick ice. The second pitch was equally testing, with blind cracks, awkward traverses and steep corners leading to the big platform on Ledge Route. We scampered down this as night fell with the splendour of an almost totally white Ben glowing above us in the starlight.